After officially announcing a $35,000 Model 3 base model, electric car maker Tesla had another ace up its sleeve: a firmware update it says will increase the power output of all Model 3 vehicles — actually making them faster with nothing but the power of software. It could mark the beginning of a new era, in which companies are able to enhance features of already-sold devices through over-the-air updates — just like the smartphone in your pocket. … so Model 3 owners just woke up to a car with faster acceleration and a higher top speed than when they went to sleep. The newest version of the Model 3 firmware promises to increase power output by “approximately five percent,” according to a screenshot of update notes posted to Reddit. How exactly the output boost will translate into speed and acceleration is unclear. 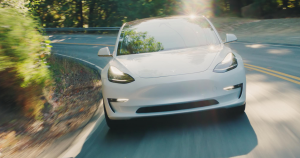 But early reports are positive: Reddit user 22marks found his Model 3 Performance to accelerate from zero to 60 in just 3.29 seconds after the update — as opposed to the 3.5 seconds Tesla has been touting so far. Previous updates have increased the range and top speed of other Tesla vehicles. Last week, Tesla pushed an update that increased the range of all existing Long-Range Model 3s by 15 miles. A different firmware update increased the top speed of the Model 3 Performance by 7 mph (10 km/h). Of course, the advertised specs for electric cars is bound to vary a little depending factors such as climate, inclines, battery levels, and driving habits. But Tesla seems to have become comfortable enough to advertise the kind of numbers its customers can expect after updating their cars to the newest firmware — no visit to the Tesla service center needed.